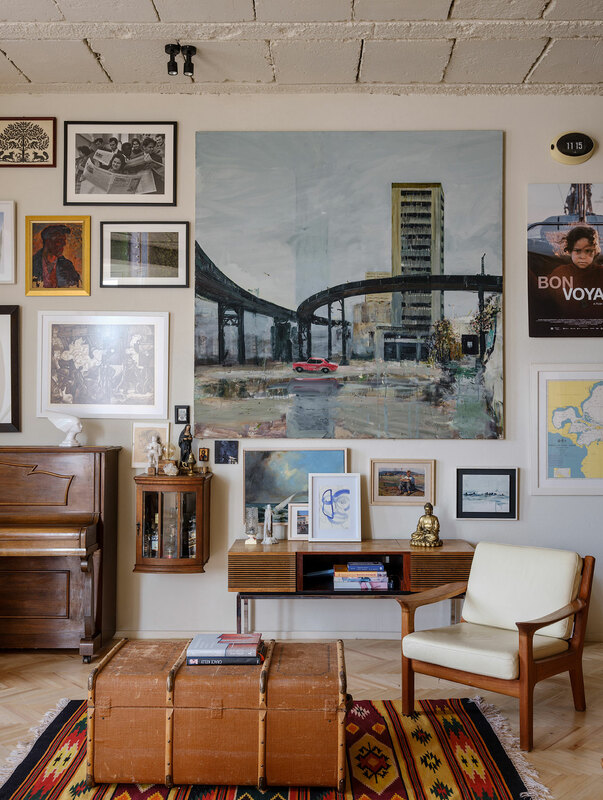 When Swiss-British director Marc Raymond Wilkins decided to move to Kiev after living for many years in New York and Berlin, he rightfully chose Reytarska, a beautiful, tree-lined street in one of the hippest neighbourhoods in the historical centre of the Ukrainian capital. 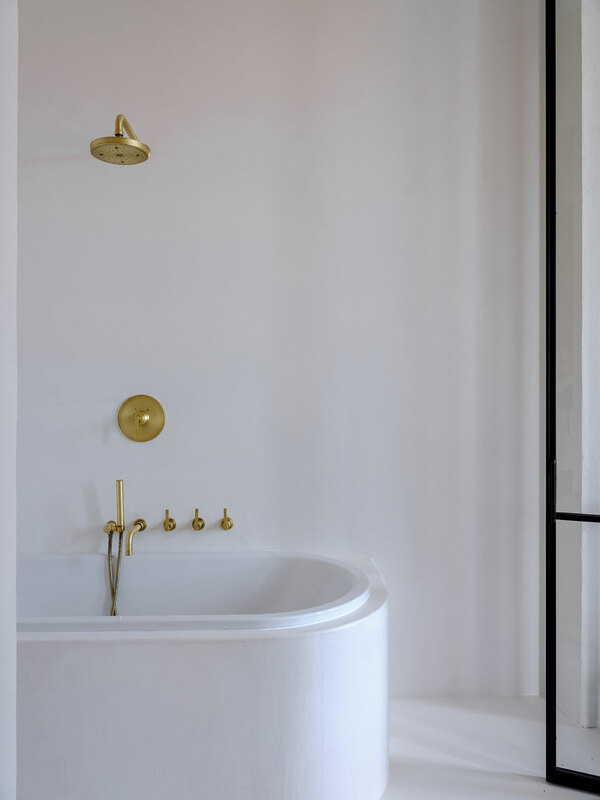 Located on the fifth floor of an early 20th century apartment building, Wilkins’ new home was designed by his friend Ukrainian interior designer Emil Dervish. 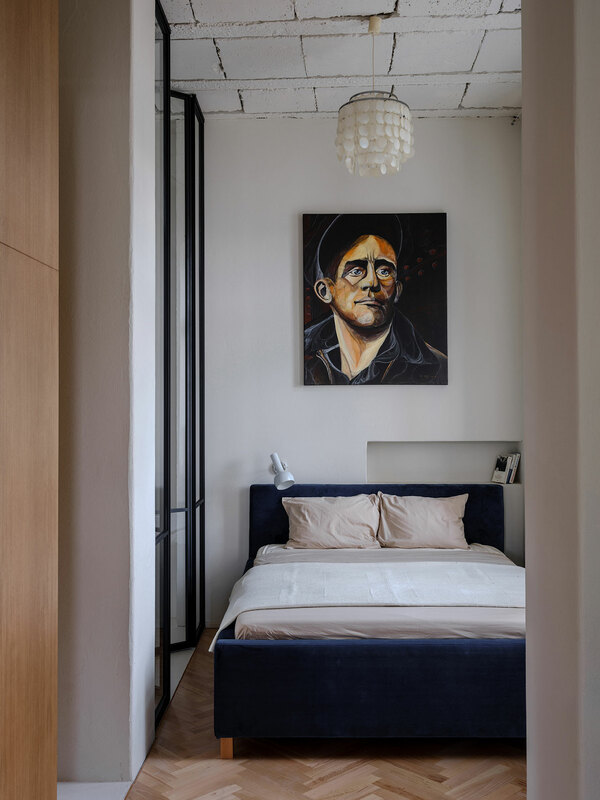 Channelling the neighbourhood’s pre-revolutionary elegance through eclectically curated interiors, Dervish’s design effortlessly reflects the owner’s unique personality. 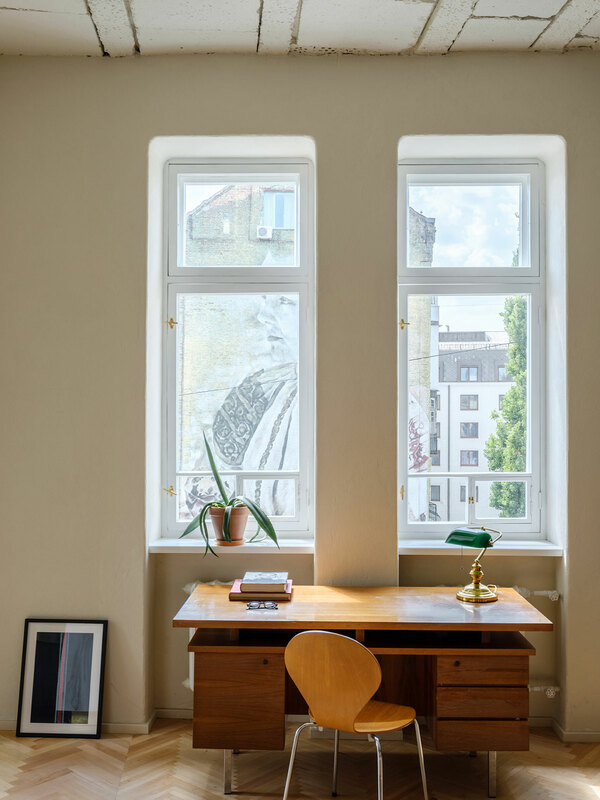 Named the “Birdsnest” due to its top floor location and the building’s quaint architecture which features a slim turret topped by a conical roof, the one-bedroom apartment features high ceilings and an open plan living space. 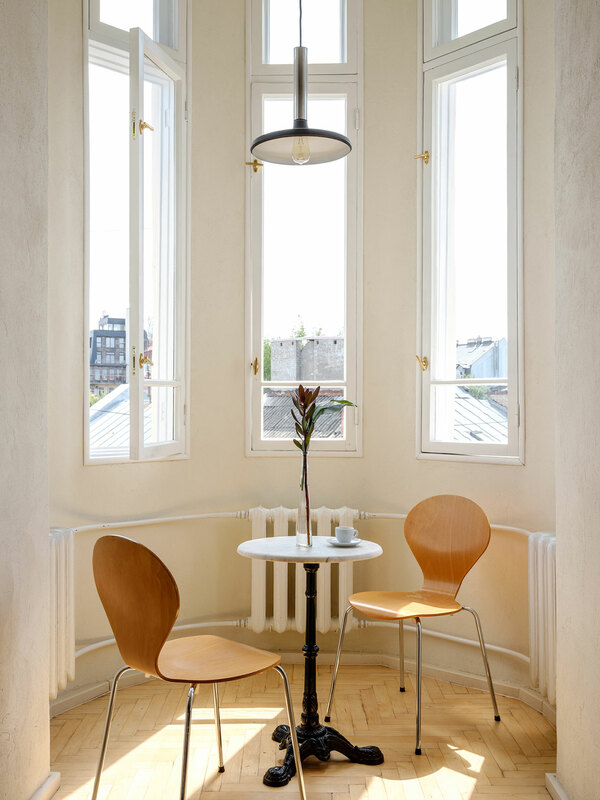 The open plan layout, which incorporates a sitting area, the kitchen, a study and an intimate dining area ensconced in the turret’s niche, allows the apartment to feel spacious despite its modest size while the glass partition that separates the bedroom from the windowless bathroom allows the latter to be illuminated by natural light. 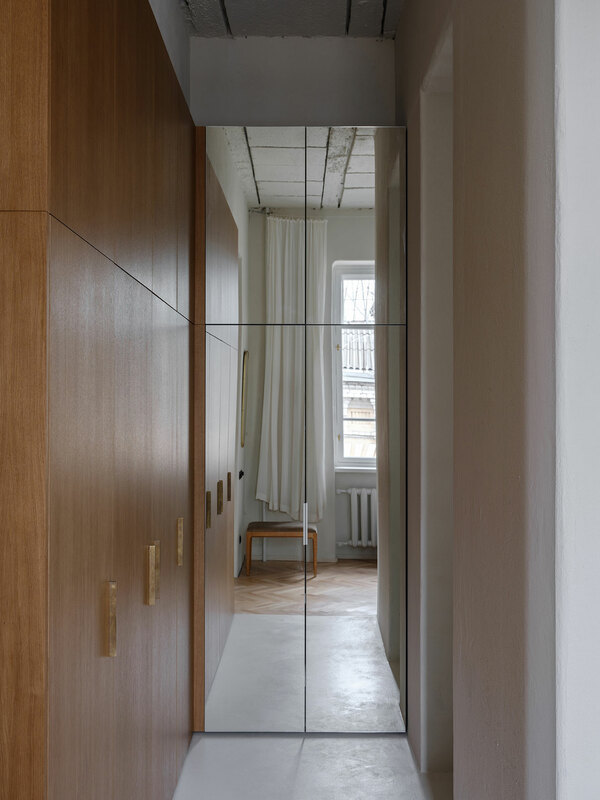 Just as elegant and clever is the partitioning of the private quarters with a structure that serves both as a bookcase on the front and as a wardrobe on the back. 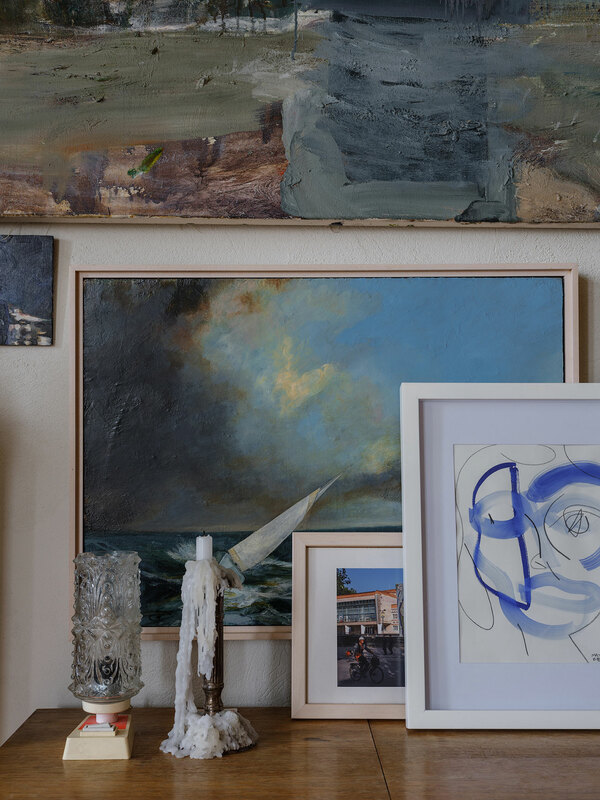 Dervish has relied on a muted colour palette based on light wooden textures and off-white tones that provides an ideal background for Wilkins’s collection of paintings, prints and photographs—including a portrait painted by his father that hangs in the bedroom. 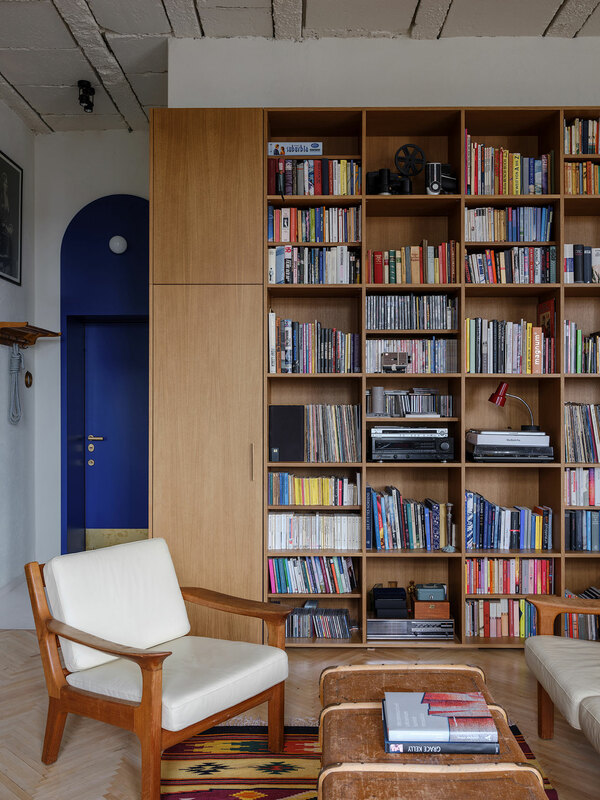 Parquet flooring, the bookcase feature and selected furniture fill the apartment with warm timber textures, while ivory plaster walls and a ceiling made of old concrete blocks painted white provide a soothing ambience. 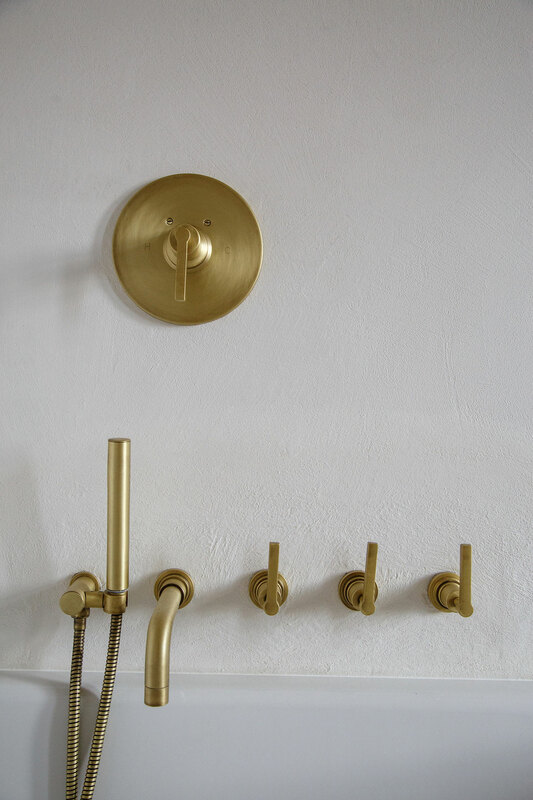 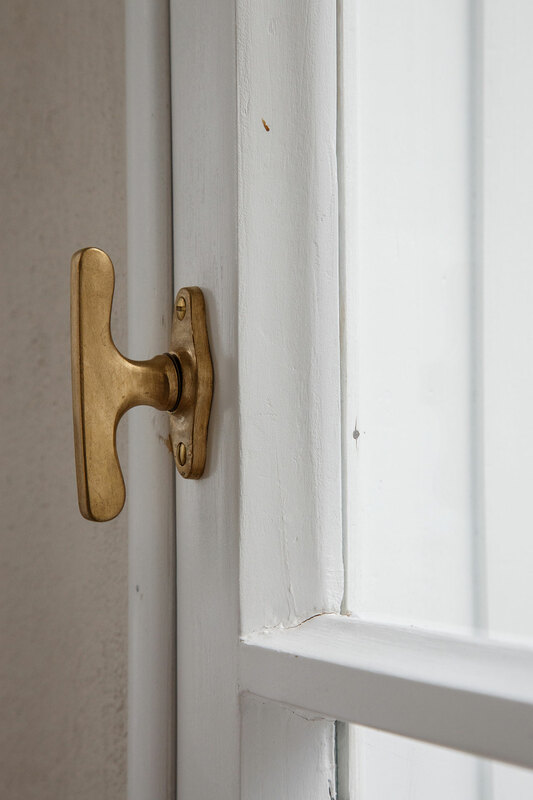 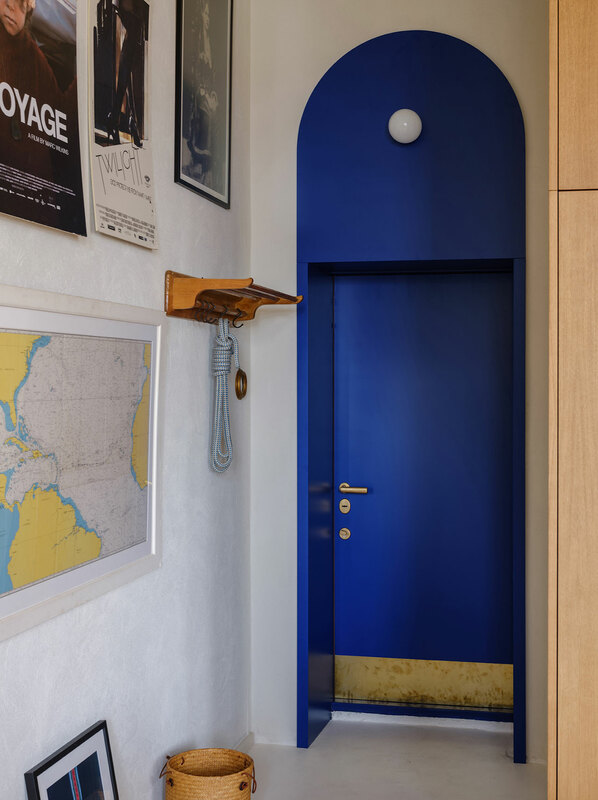 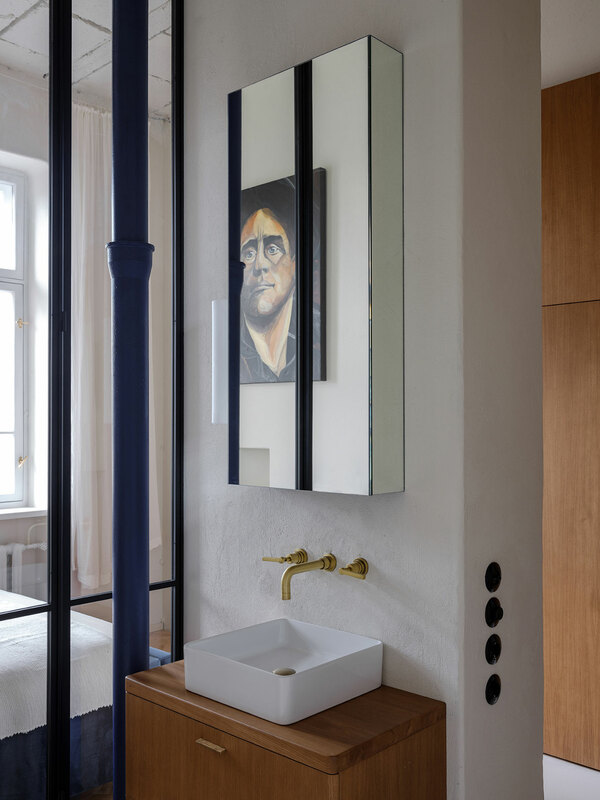 Bespoke brass details like door handles and faucets, especially designed for this project, as well as a stunning brass cupboard in the kitchen give off a sense of understated luxury while splashes of cobalt and dark blue round up the décor. 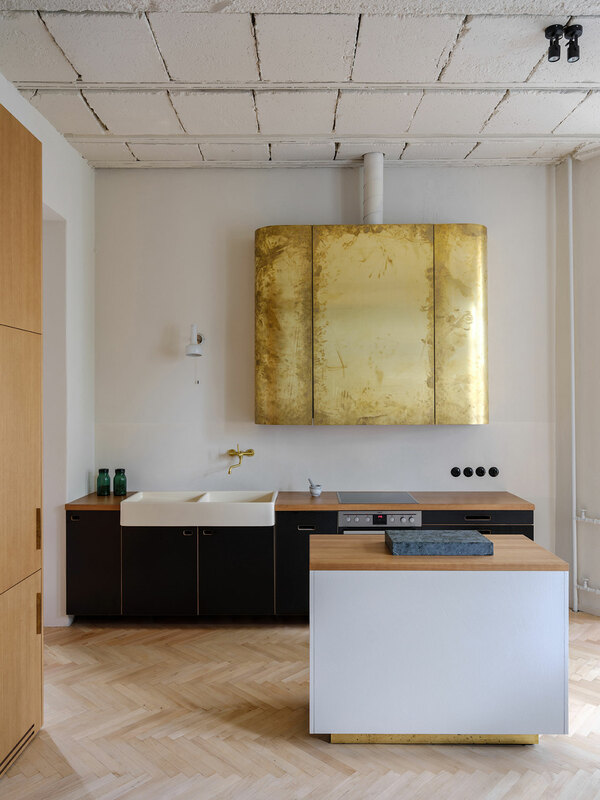 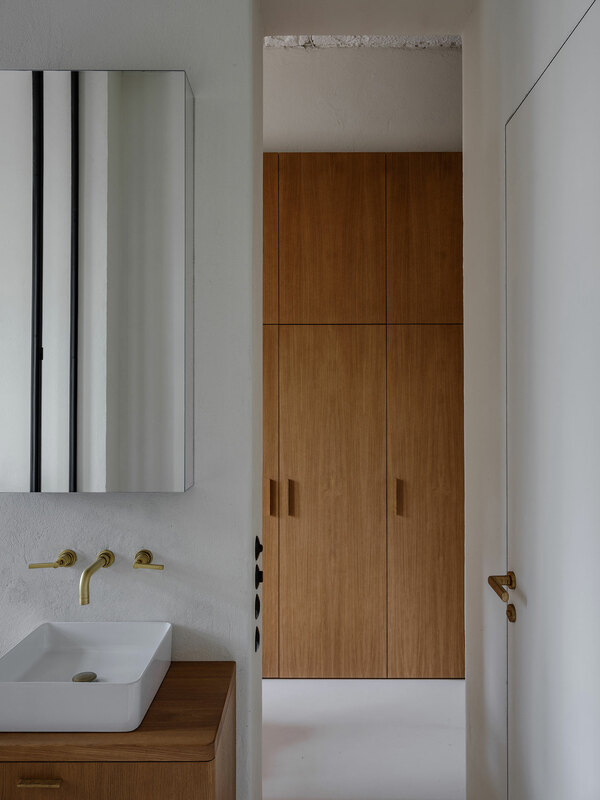 The apartment’s renovation is underpinned by a minimalist sensibility of clean lines flowing into simple geometric shapes which allows the owner’s vintage furniture pieces to take centre stage. 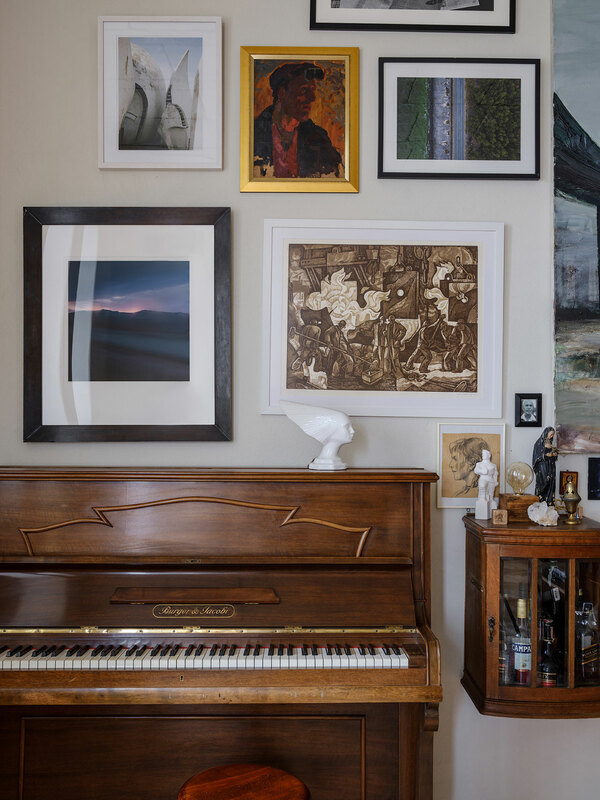 A sofa and armchairs transported from Berlin, a hefty kitchen sink that used to belong to Wilkins’ great-grandfather, and an upright piano that he inherited from his mother among other pieces not only provide a personal touch but also beautifully tie together the contemporary and the nostalgic aspects of the interior design.